For the Meatballs: In a large bowl add the ground pork, ground beef, panko bread crumbs, allspice, nutmeg, onion, garlic and parsley. Season with salt and pepper to taste. Mix until fully combined, using a tablespoon, scoop into 20 small meatballs, about 3/4-inch in diameter and roll into balls with your hands. Heat a large skillet over medium-high heat and add olive oil and the meatballs. Cook turning continuously until brown on all sides and cooked through, about 15 minutes. Transfer meatballs to a plate and cover with foil. Add butter to the pan, scraping any of the browned bits from the bottom. Then add the flour, whisking to combine. Whisk the beef broth and Worcestershire sauce, and allow the mixture to come up to a simmer. Whisk in the Dijon and cream, and season with salt and pepper to taste. Remove sauce from heat, and strain through a fine mesh sieve into a large bowl. Return the sauce back to the pan over medium heat, then add the meatballs back into the pan and toss to coat and warm through, about 5 minutes. 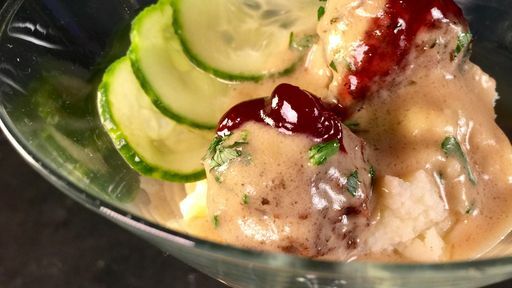 Sprinkle the top with the remaining parsley and serve with potato puree, pickled cucumbers and Lingonberry jam. For the Potato Puree: In a large pot, add the potatoes and cover with cold water. Place over medium-high heat and bring to a boil. Season generously with salt. Cook potatoes until tender, remove from heat and drain potatoes. Using a potato ricer, rice the potatoes into the pot. In a small pot over medium heat, add the milk and cream and bring to a simmer. Once heated, add to the the potatoes, then add the butter and stir to combine. Season with salt and pepper. Top with chives and serve with the Swedish meatballs. For the Pickled Cucumbers: In a large bowl, add vinegar, water, salt, sugar and bay leaf. Whisk to combine, then add the cucumbers and toss to coat. Cover with plastic wrap and refrigerate for at least an hour. Tip: Serve this as a meatball bar for a party appetizer! Serve in a martini glass for a retro theme!